Discussion in 'Article Discussion' started by Tim S, 11 Jun 2009. Having tested plenty of mini-ITX kit recently, we've been searching for a quality low profile cooler to squeeze inside our HTPCs. We've bagged three miniature coolers to find out if, when it comes to keeping your system cool, does size matter? Suits me. My OEM casing only allows for coolers <140mm in height... Even though it's a full ATX case. Of course, I'd probably best be getting a cooler using 92mm fans, rather than these HTPC coolers. I swear I had a taller version of that Akasa cooler on my thunderbird 1.2 GHz about 6 years ago. Surely testing in an ITX case would have been better afterall that is what these coolers were designed for. Sure it might limit airflow and that might affect the cooling ability of the coolers (maybe even discriminatory) but as that's what these were designed for that 's what the review should try to discover. now you made me curious. does this have any value as GPU cooler (despite its size)? Funny, before I even read this review I knew the Zalman would win lol. although it’s a little disappointing to see that there’s no PWM connection, meaning the fan will run at its full speed of 2,800rpm constantly. Other than that, good review, and good to see Zalman still making atleast some decent products. although its a little disappointing to see that theres no PWM connection, meaning the fan will run at its full speed of 2,800rpm constantly. Not all motherboards have the option to do this. The only way to control a 3-pin fan's speed is by adjusting the voltage, a feature which many motherboard's dont support, and if they do, are controller by the motherboard, not the cooler. We'd just end up with a bunch of coolers all performing identically.As such, we test using only using the PWM option of the fan (which can, of course, be overridden by BIOS options itself) or, if a 3-pin, at full speed. My HTPC (Gigabyte GA-E7AUM-DS2H mobo) is currently wearing an Arctic Cooling Freezer 7 LP on its Intel E4400 CPU. It just still seems a bit harsh. I know I've had a fan controller in all my mobos for the last 7 years. so, where on earth exactly can you actually _buy_ the gelid cooler in the UK? The gelid cooler fits to my zotac 9300ITX ultra silm HTPC project, where can buy it?
" If we’d testing in a small case then limited airflow might have favours one cooler over another." ... which, if we ignore the english for a second, is exactly what you'd be interested in in a low profile cooler. surely. Is the US price for the GELID in the wrong currency? Every motherboard I've used has been able to use PWM without a fourth pin (yes, pwm - not undervolting). Download speedfan and if it doesn't work straight away, play with the advanced settings - different motherboards use different types of PWM. Using speedfan you can set the fans to any level you want - keep turning it down until it's silent and then you're sorted! To my knowledge, PWM is impossible without the forth pin feeding back information from the temperature sensor onboard the cooler. Some motherboards do allow you to adjust three pin fan voltages on the fly, where apps like speedfan work great, but they take information from the CPU temperature sensor. This feature, while useful, isn't available on all motherboards, and is usually limited to BIOS controls like Asus' QFan. Either way, it doesn't take a genius to go out, grab a fan controller (or even a step down voltage cable) and drop the fan's voltage, but with these coolers that's going to dramatically impact on cooling performance. Perhaps not dangerously, but it adds another variable which somewhat undermines the whole point of conducting testing. Even a world beating heatsink will be rubbish with a fan running at 100RPM, while even a rubbish cooler can be good if you strap a delta screamer onto it. It's a matter of preference and if you choose to manually adjust fan speeds at the cost of cooling that's you're personal choice. 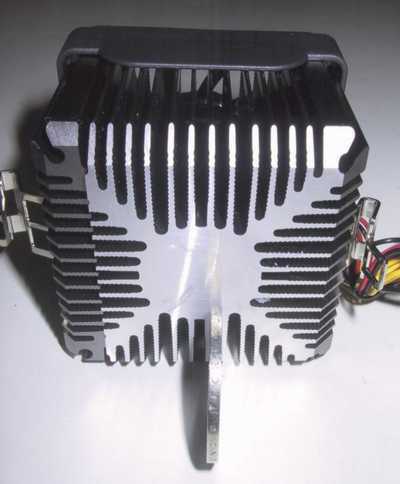 they've used the gelid silence 775 heatsink with the dg45fc. I'm interested to know if you/they modified it or the backplate or do anything special to fit the heatsink?